Trinidad Powder Coaters, a division of Panland Trinidad & Tobago Limited, was launched in 2007 to meet the growth and diversity in the demand for the superior finishing techniques across a variety of industries. This resulted from the pioneering effort of Panland's President and Founder Michael Cooper, in being the first to apply the innovative and fast growing technology to the steelpan instrument, building upon the company's well-earned reputation of being the leading producer of the steelpan instrument worldwide. Today, TPC boasts of being a market leader in custom Powder Coating services and applications, due to the superior quality, service and affordable pricing options we provide to our custumers. 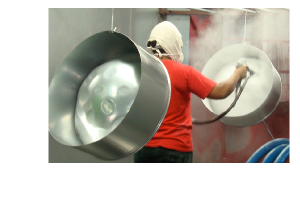 As the only local member of the Powder Coating Institute (PCI) our technicians are experts in the most advanced powder coating techniques resulting in high levels of customer satisfaction and a loyal client base of corporations, medium and small enterprises, and individual homeowners.